I’ve been seeing red very often these days. It started early this year when The Guardian posted a picture of a bright red Jianhe River in Luoyang, China. The colour was caused by illegal wastewater discharges from chemical plants. More colours followed from Bangladesh, a whole kaleidoscope of them. The country has paid a huge environmental price for being the second largest exporter of garments to the US after China. 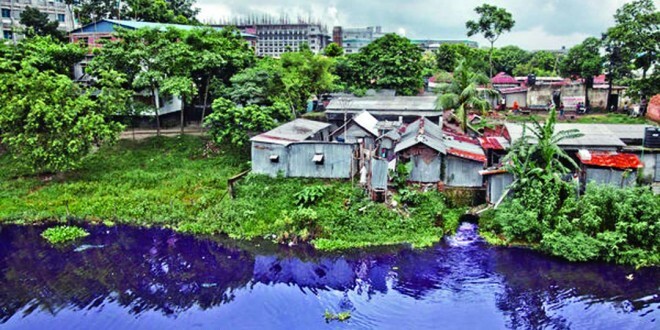 Pictures from Bangladesh show red, gray, blue, purple rivers – depending on the colours used in dyeing operations in garment factories. Or rather, depending on the colours in fashion. For quite some time, it has been known that the world’s developed countries have outsourced their environmental pollution to developing countries. Whether it is textiles, leather goods, pharmaceuticals, electronics or chemicals, the waste streams and emissions in the industrial towns of China, Bangladesh, Pakistan, India, Indonesia, Vietnam and Thailand are choking rivers, vitiating groundwater and filling the air with noxious smells. That favourite colour we pick from the rows of T-shirts labelled ‘Made in Bangladesh’ has most likely run out of a garment factory into a nearby canal or river and sickened thousands of people living near it. The Citarum River in Indonesia called the ‘dirtiest river in the world’ has hundreds of garment factories on its banks. A few months back, Greenpeace released a report indicting international fashion brands such as Gap, Old Navy and Banana Republic for collaborating with toxic suppliers along the Citarum. Are buyers like you and I also responsible for sacrificing poor communities at the altar of fashion and creature comforts? Perhaps. If buyers were to engage in campaigns such as buying garments only from manufacturers with environmental certification, it could be a starting point to force more responsibility. In the past, there has been success in doing away with ivory and animal fur in the market (albeit mixed success) as also carpets produced from child-labour. Buyers in the US and Europe would gladly pay a few dollars more for products to cover the cost of cleaner emissions and discharges. But a far bigger responsibility lies with political leaders in exporting countries. Despite having pollution control laws, in many of these countries, it is easy to bribe inspecting officials or provide doctored ‘samples’ for getting environmental clearance. One official in the Bangladesh environment ministry was transferred out when he began to conduct night-time raids to catch industries illegally dumping their wastes without treatment. Companies involved in the business of export certainly do not lack money-power. Despite all-round awareness of the pollution problem, political leaders have showed no urgency in handling it. In fact, they have largely been hand-in-glove with powerful industrial lobbies. In February this year, a Chinese entrepreneur challenged his city’s environmental protection chief to swim in the local polluted river. The official declined but the novelty of this dare sent the social media into a tizzy. Meanwhile, in India, a spiritual leader died after fasting for 115 days in a protest against illegal mining on the banks of the Ganga; a protest which was sadly under-reported in the press. The time has come for more vigorous activism over environmental pollution. A guilty Macbeth wondered if all the oceans in the world could wash the blood on his hands. Who is to make governments, industries, retailers and buyers feel guilty for the effluents let loose by affluence? ← Will PPPs transform Delhi’s water supply and demand?